A kindergarten that cleverly combines a modular approach reusing old industrial shipping containers with an innovative approach of colourful magnets - offering a fun way to brighten up a boring and cold facade and encouraging fun and play all at once! 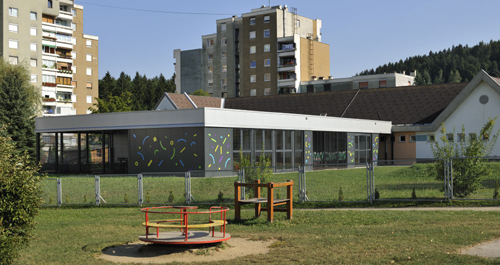 Kindergarten Ajda's new modular extension in Ravne na Koroškem, Slovenia, designed by Architektura Jure Kotnik - was built to replace the small temporary container solution that the architects designed previously to provide immediate relief for lack of kindergarten space (see below). Like a parasite the container structure attaches itself to the existing building. The architects collaborated with sticker artists Kitsch-Nitsch to come up with a way to transform the cold steel facade into something more child-friendly. I was reading this article today and came across this quote, which is talking about the adult 'kidification' of spaces which has been and still is a reflection of the interior 'decorations' of many schools, that patronises children, and treats children as passive innocents needing to be "filled with information" (Tarr, 2001). 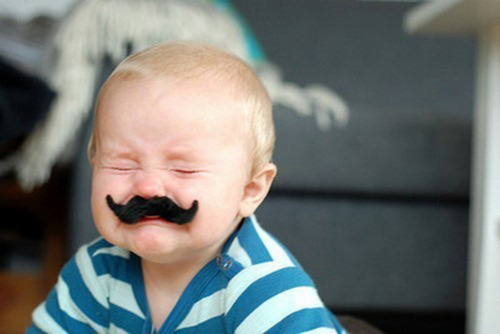 "He or she is not an innocent, apart from the world, to be sheltered in some nostalgic representation of the past reproduced by adults. 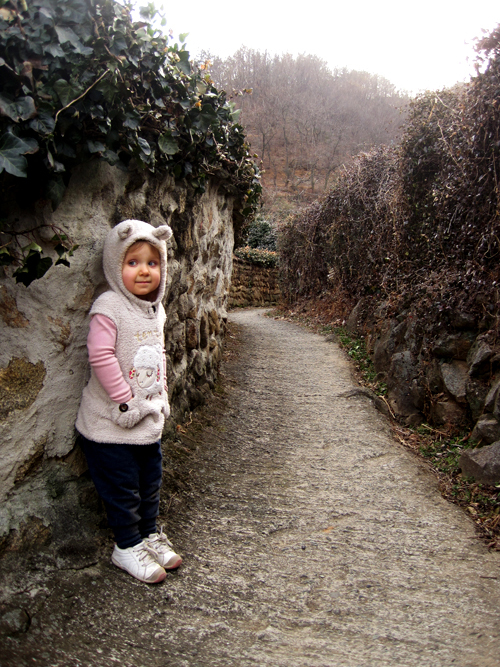 Rather the young child is in the world as it is today, embodies the world, is acted upon by the world - but also acts on it and makes meaning from it" (Dahlberg, Moss & Pence, 1999: 50-51). 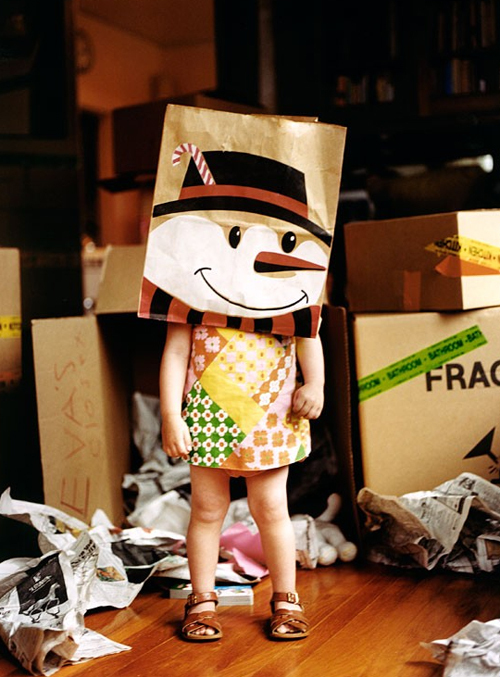 Inspiring creative and active play and 100% recyclable are both things that I like to hear. 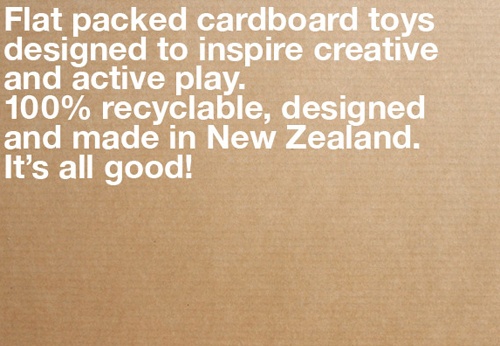 That is why I love this range of 'toys' designed by clever kiwis flatout frankie based on the oh so simple cardboard box. 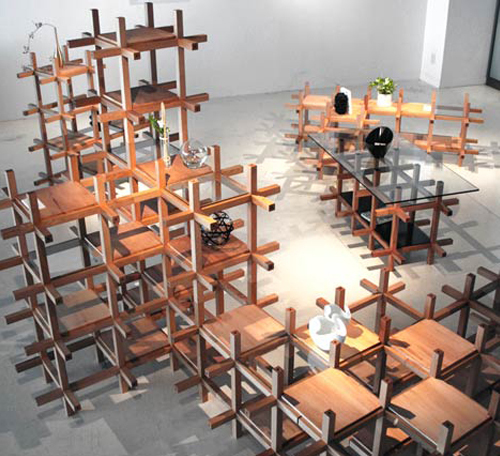 I love the work of Japanese architects Suppose Design. Scouring through their website I found these concept images. Unfortunately I can't find any information on them. A miniature suburb? A scattering of playhouses? Or rooms within a room? 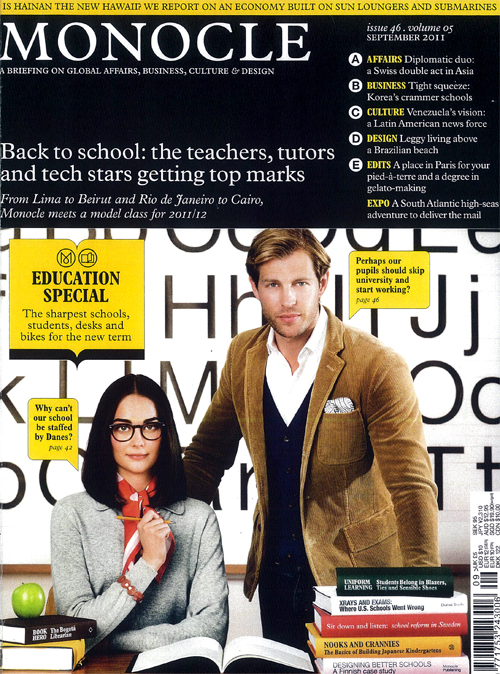 In Monocle's September issue - they look at school architecture, and those countries that are with architects starting a new school building revolution: "demonstrating that a healthy learning environment with plenty of light and natural materials means happier children and long-term economic benefits". 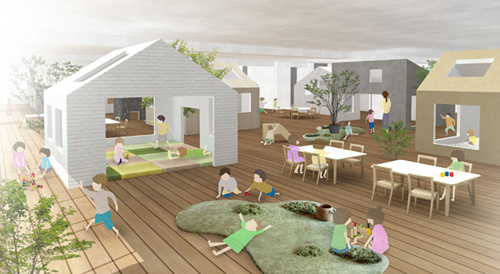 In their article: 'Best in Class - Global', Monocle explains how in Japan recent projects are demonstrating a new breed of early childhood centres, which are designed to feel more like homes than schools. When Yoshiji Takehara (of Moo Workshop) was hired to design a new early learning centre, he decided on a contrarian approach. 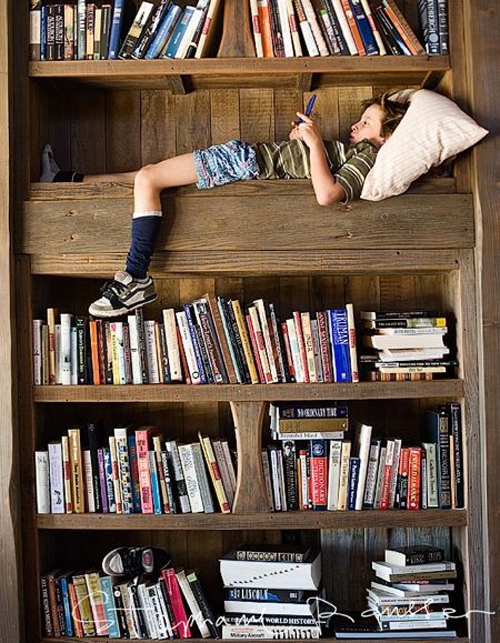 He decided to give the school lots of "wasted space" - alcoves, cubbyholes and meandering hallways. Taking the design metaphor of a cell, this centre situated in Sarreguemines, France designed by Michel Grasso and Paul Le Quernec is interesting in a number of ways. The idea of the early learning centre as a cell...a reference to nurture and growth perhaps? The architects have placed (accordingly) the nursery at the centre representing the nucleus ('the control centre of the cell'), the surrounding gardens for play as the cytoplasm, and the enclosing curvilinear boundary wall as the cell membrane. "The school of tomorrow will be a garden city of children; that is to say a place of many shelters - a township, if you will, of small schools built as one community but with every shelter organised as a separate unit... 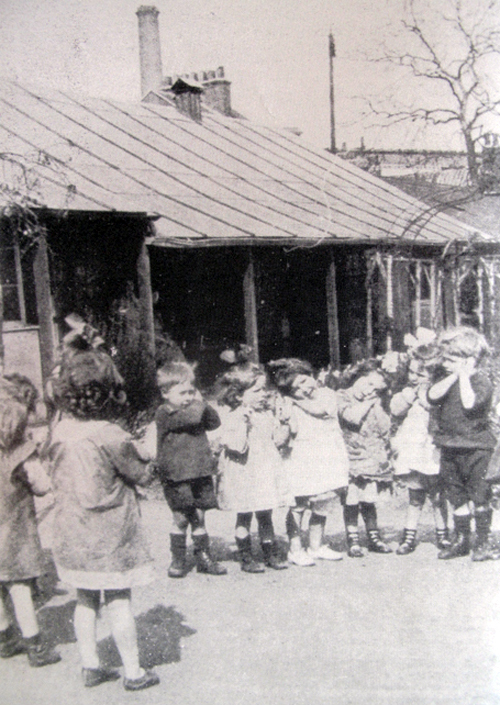 It is also a self-contained unit or school home; it has its own Head; it also has its own bathroom, its own equipment, and its own day, adapted to the needs of children at a specific stage of development (Margaret McMillan, 1928). Margaret's vision for early childcare that was to liberate children from the cramped slum-conditions of industrial London. 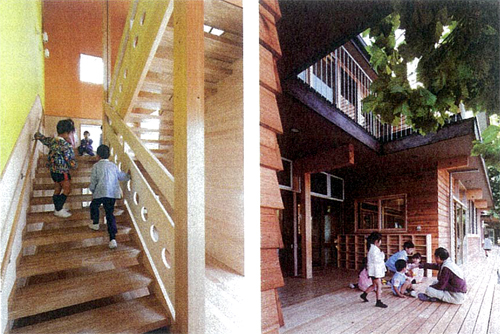 Via Kindergarten Architecture by Mark Dudek. 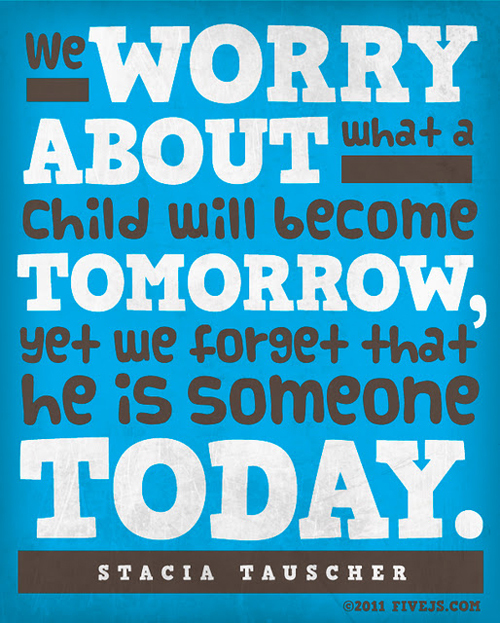 A very true mantra - that we must always remind ourselves of. And once you're over one set, peel off and replace with another! Blik offers a wide range of wall stickers designed by a selection of artists and designers and pretty reasonably priced too! A great (quick and easy) way to brighten up any wall - and making for a much more playful environment. Imaginary Castle by Patrick Hruby. 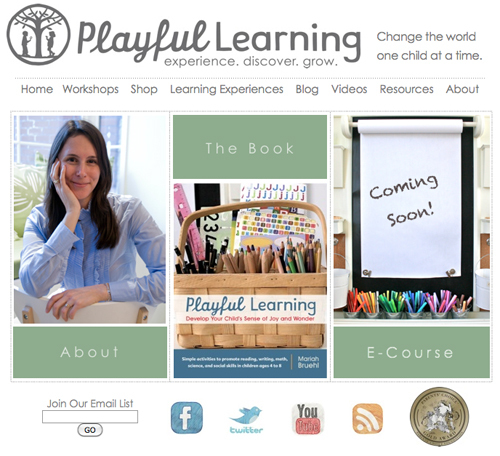 Check out Playful Learning for loads of inspiration and resources for meaningful learning for both children and adults to experience together. Photo taken by Stephanie Rausser via Repurposed Playground. 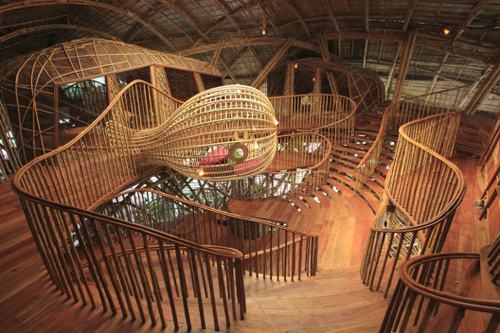 Three designs in Asia that utilise local bamboo and weaving construction methods - creating magnificent eco-friendly structures for children. 1. The ecological children activity and education centre located in Koh Kood Island, Thailand - designed by 24H architecture is part of a series of ecological projects for the Six Senses Resort on the island. The children's centre design teaches and makes the children aware of ecological principles as well as being a space for children to hang out and play in - housing a cinema area, library and reading zone, and art room and music room. Designed by Atelier 9.81 is the Digue Dondaines Nursery fitting out the ground floor of an apartment complex in Lille, Northern France. 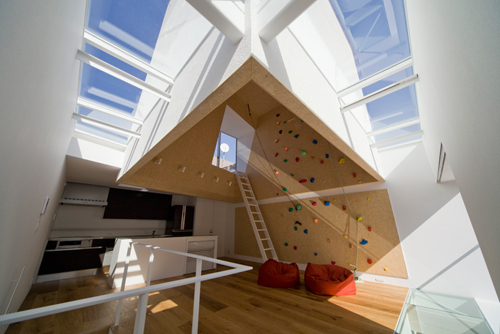 Making use of the space available to them, the architects have concentrated on creating stimulation for the child inhabitants through creating both interesting ceiling and floor planes. They also designed a nice wee graphic - which is exhibited on the surrounding walls and glass windows - allowing for design continuity, a unique edge and a bit of privacy from passers by. The use of (a minimal) colour palette emphasises the sculptural quality of the spaces, whilst the ceiling projects white circle (cloud-like?) disks - set at different angles and heights. Here you can see the sloping topographical floor terrain - challenging children's physical motor skills and co-ordination - whilst also encouraging play. 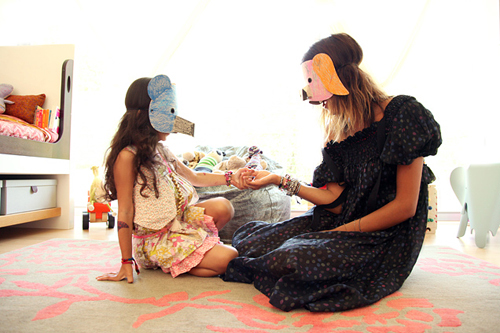 "Ideally a child's play space should never be finished, it should be in a constant state of change...Children, you know, have a way of creating their own worlds." Susan Goltsman, California, MIG. 'Kids Don't Need Equipment, They Need Opportunity' by Ellen Ruppert Shell (1994). Quote via Project for Public Spaces (PPS), photo via Stephanie Rausser Photography. The Child Forum is a website which offers "fresh thinking, advice, research, analysis and information" on childcare and early childhood education. It is also providing a (continually updated) summary comparing New Zealand's political parties' policies as they relate to early childhood education - including topics of funding, management, as well as family, community and cultural issues. National has stated however, that it will be implementing new web-based tools for "rating" ECE services - and helping parents choose an ECE centre. Education Minister Anne Tolley says "parents told us they want to know their children are being educated and cared for in a high-quality environment". 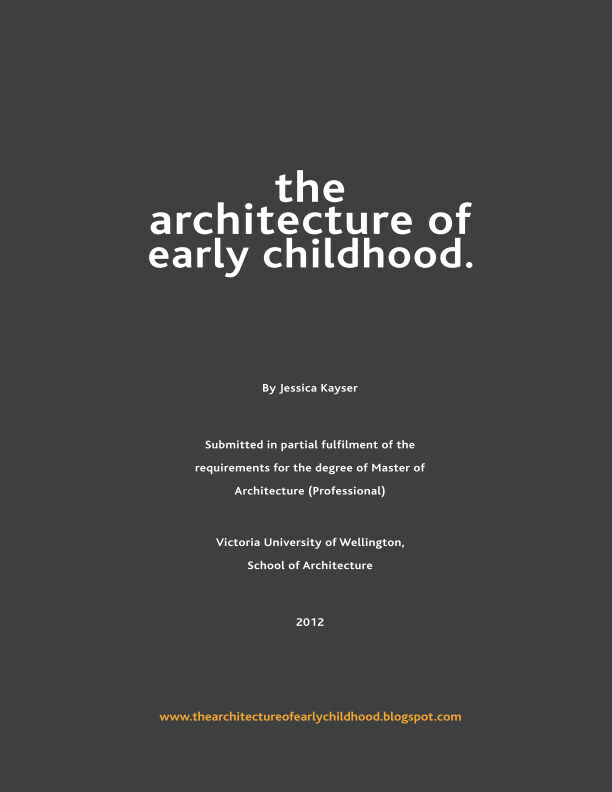 Perhaps such a tool providing both an outline of centres' philosophies surrounding their learning environment and photos describing it - will encourage New Zealand centres to improve the architectural quality of their environments? 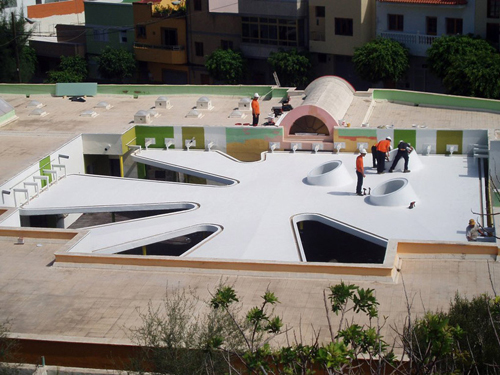 A new patio transforms an existing nursery into a "living landscape"
'Puzzle Piece', a designed canopy, situated in Spain and designed by Romera y Ruiz Arquitectos has won the ‘World’s Best New and Old Building’ award at the World Architecture Festival (WAF) Awards 2011. The design has been described by one judge, Trillo de Leyva, as "a new organic landscape that grows against the rigid typology of the original building...the bright colours and soft shadows turning it into a living landscape". The brief was to design a cover for the original building's patio to provide a naturally ventilated area giving the young children protection from the sun and rain whilst engaging in play. The canopy structure is suspended from the existing roof structure (as seen above) - whilst the minimal pillars assisting support are coloured different shades of green - like a forest - they enable the kids to swing on and interact with them, whilst blending in with the surrounding vertical striped coloured walls. Here are the architects concept diagrams, which takes into account people's circulation, rain and sunlight. 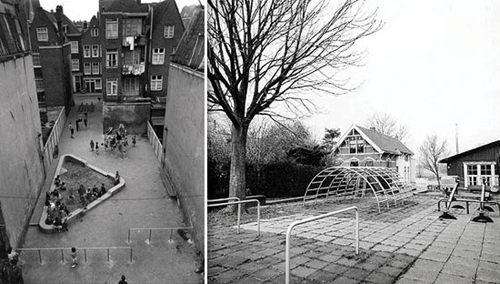 An example again of how an addition (like Baupiloten's) can transform an existing centre - to one that is a more living experience for the children. And the overall winner, winning 'World Building of the Year' is this office building in Barcelona, Spain designed by Cloud 9. 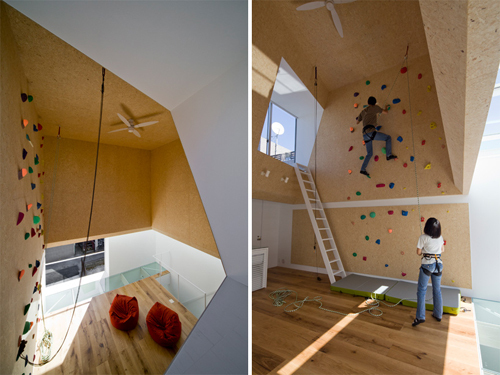 Picked for its ambitious, imaginative and bold approach of tackling issues of sustainability (it is almost a net zero building), the head architect Ruiz-Geli on accepting the award said he hopes the building will act as a 'seed for an environmental revolution' - and with his children (top left) he added, 'these are our clients' (his son Lago helped with choosing the green colour that dominates the building).